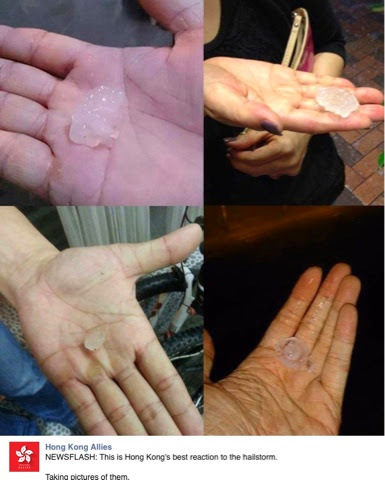 An unusual thing happend today in Hong Kong - Hong Kong experienced a Hail Storm! If I am not wrong, this is the first time that it happened here. Not only I, but everyone from Facebook to the TV news were surprised. This must be the effects of climate change, what else can happen? My husband, Mac then said it is a hail storm. I am not really familiar of what hail storm is so I have to have a look at Wikipedia. "Hail storm is a storm that produces Hail and Hail is a form of solid precipitation." It would not be really nice if you don't have an umbrella at that time. I am lucky to be indoors because I am the type of person to forget umbrellas! Anyway let us leave it as that. Mac ended up taking an off today and so far, everything seemed fine outside - except flooding in some malls, I saw some pictures and videos of it online. On a more positive note, I watched the live showing of Rugby Sevens - England vs New Zealand and I realized Rugby is an enterntaining and exciting sport to watch. Maybe in the future, I should watch it at the stadium itself and join with the chanting and all that fun. New Zealand's ALL BLACKS won because they play really quite well. New Zealand is one of my favorite countries in the world and I thought it will be a real pleasure to see them play live. On the other hand, I have no idea that Bruno Mars is in Hong Kong. Here comes Monday again! I had a relaxing weekend - not much activities really. I better proceed to slumber soon to further prepare for another Hell Week!